New Yorkers, the people of America and so many of us around the world will never forget 9/11. The memorial of two beautiful cascading water features, with names engraved, lie tastefully beside the building where the twin towers once stood. 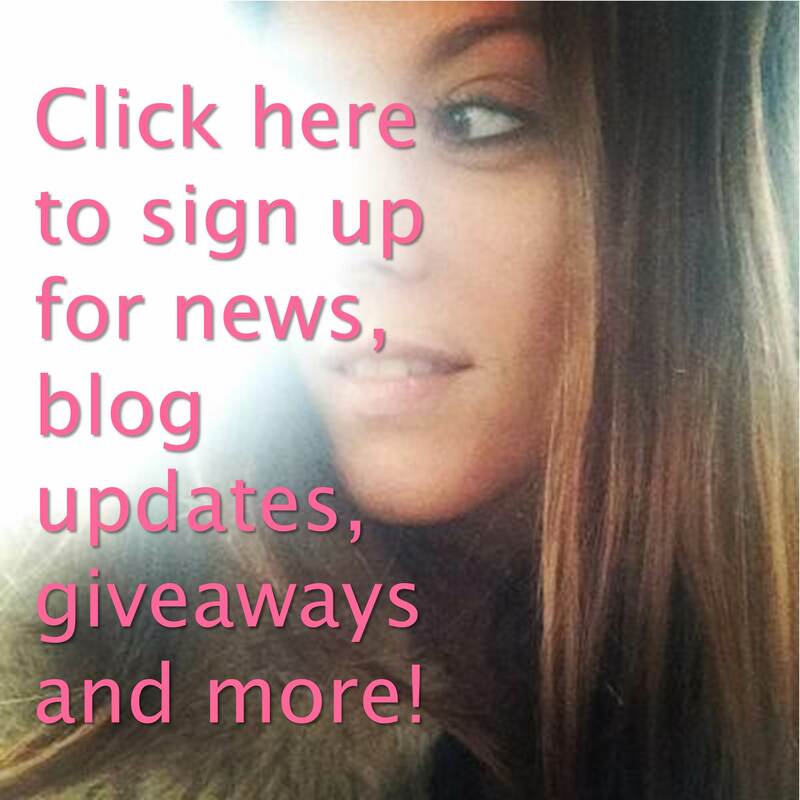 I have a fear of tall buildings – the height, the giddiness and especially the lifts. On my first day in New York I got as far as the front entrance, took one look up the building and said “nope, not happening” before I turned around and ended up shopping in Century 21 for the rest of that morning. A few days later, I’d spent a lot of time dwelling on the fact I knew I would regret not experiencing the new skyscraper that had reclaimed New York’s sky, and the views it promised. 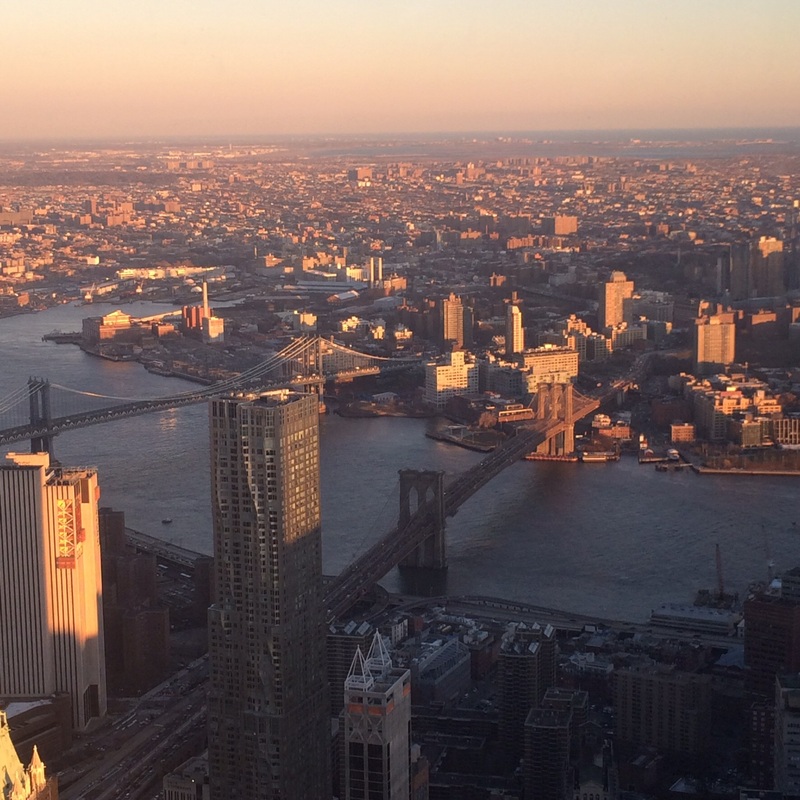 I decided that the history, the sentiment and wow-factor of this new property outweighed my fears (which now feel insignificant), and before I knew it, I had bought a ticket and was in the lift taking me up to One World Observatory – 102 floors above ground. Looking down in the elevator! I must confess that I *may* have had a glass of wine before I stepped foot in to the building, and *maybe* I drank some more wine once I had reached the top. I was pretty nervous! My boss had jokily (but clearly!) 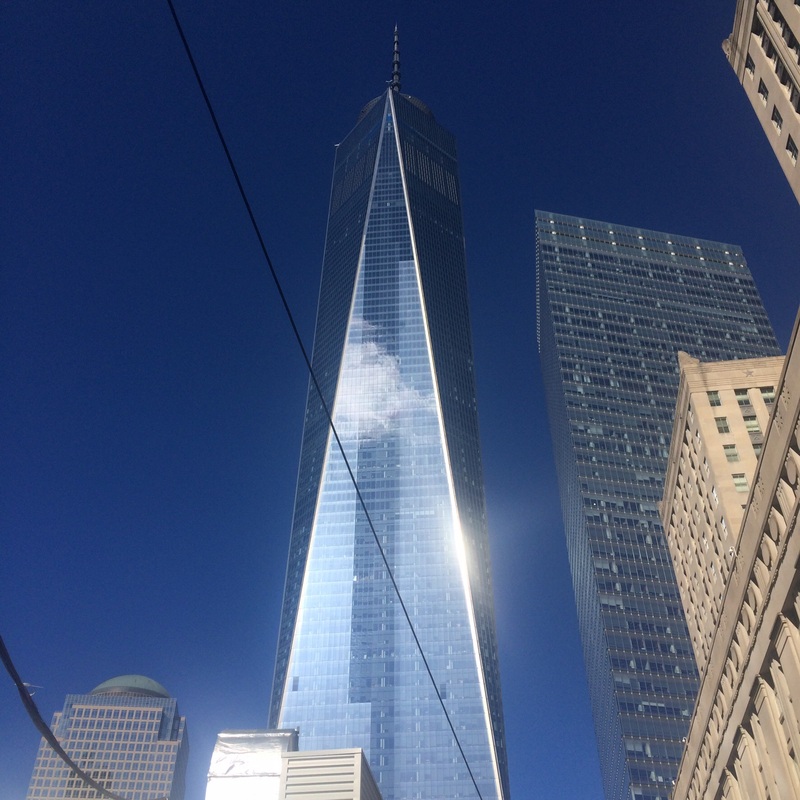 said he’d be disappointed if I didn’t experience One World Trade Center – and I’m so glad his words pushed me to do it! I emailed him straight afterwards not even thinking what time it could be back at home in London!! The lift takes just 47 seconds (not like I counted or anything!) and I swear you do not even know you are moving. I don’t want to ruin the surprise for any of you, but what happens at the end of the 47-second elevator ride is mind blowing. Amazing… I welled up due to the overwhelming feelings of amazement. 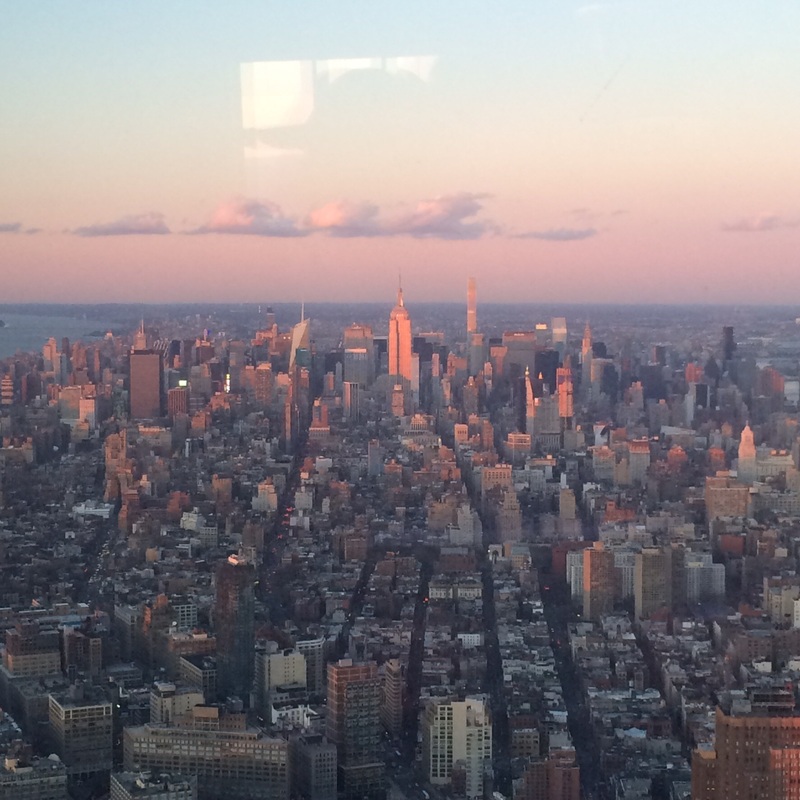 You then head to the observatory, a large floor offering a 360 degree view of New York City and beyond. With floor to ceiling glass panels, the views are astoundingly beautiful. I was so lucky to be here on a clear sunny day – I could see for miles and miles. 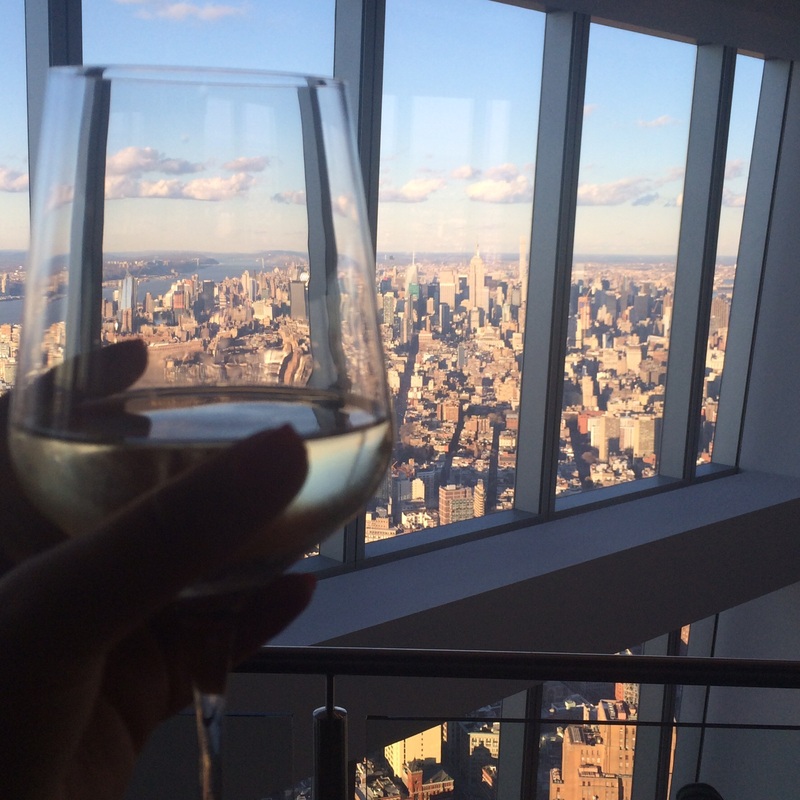 I enjoyed a glass of wine in the lovely bar/restaurant, and sipped whilst I composed myself and realised I’d made it to the top, and then absorbed the views of Manhattan. I stayed for sunset, and stood looking south at the pretty colouring in the New York sky as the sun began to set. 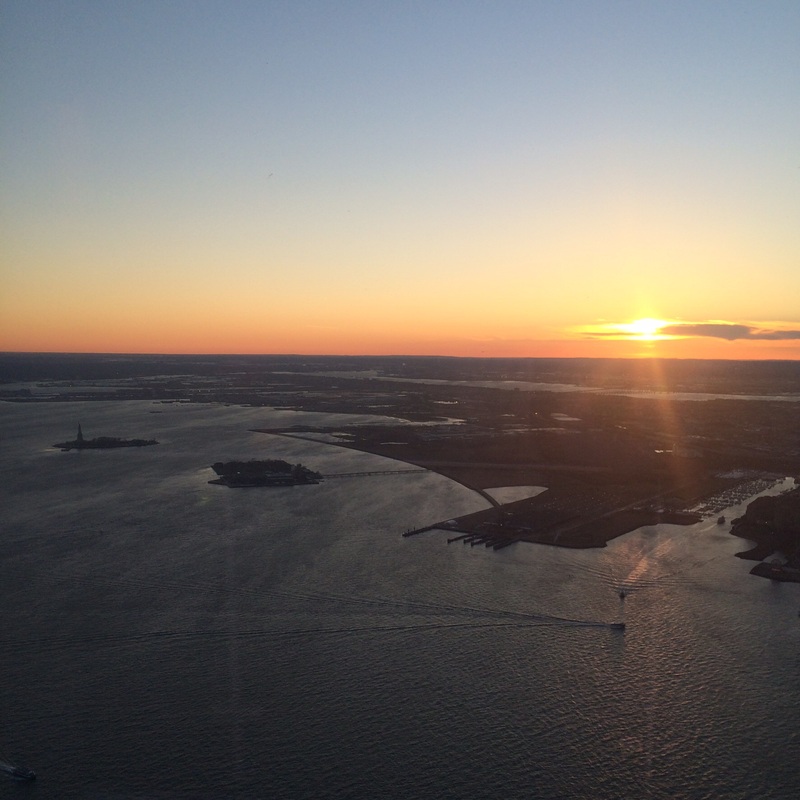 The Statue of Liberty’s torch lit up, another iconic symbol – enlightening the world. Looking south. 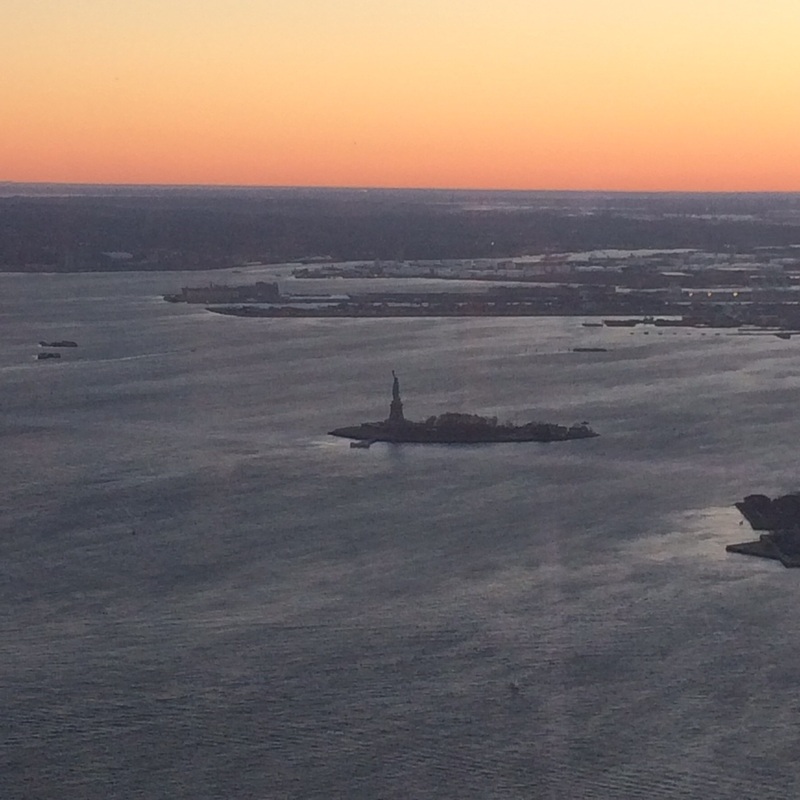 Statue of Liberty middle left. Beautiful sunset. 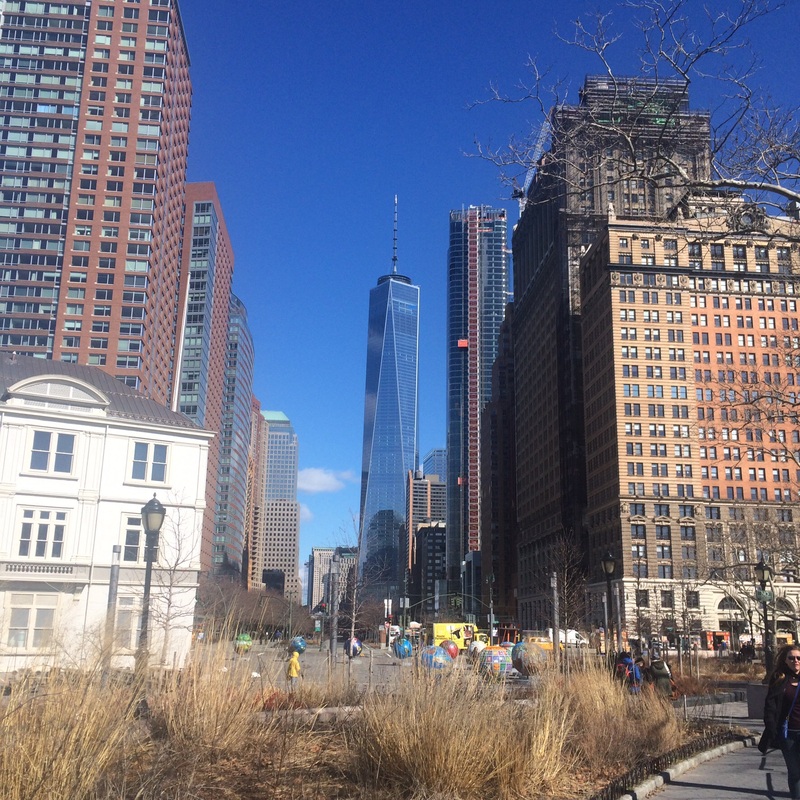 The building and the whole experience was so positive and uplifting, with no reference to the 9/11 attacks (that’s what the memorial and the museum are for). Beautiful. Manhattan and Brooklyn bridges. 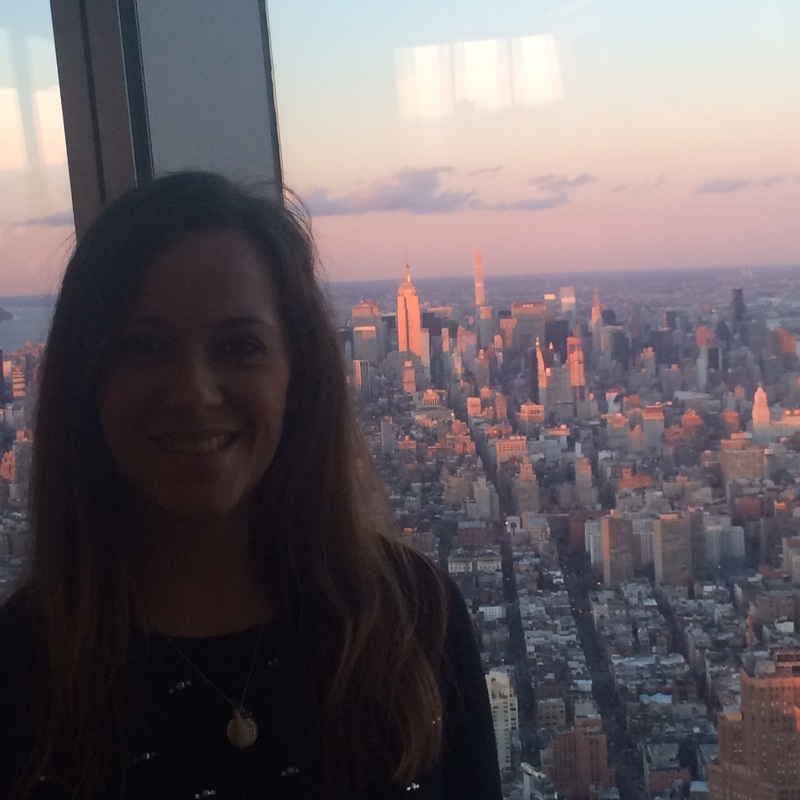 One World Observatory is not only a fantastic attraction for great views, but for me will always now hold a place in my heart for tackling a fear of heights and elevators. Part of my healing after a terrible start to the year was to start pushing myself through barriers and fears, and I now feel this is one mega breakthrough. Go me! Nerves subsided. 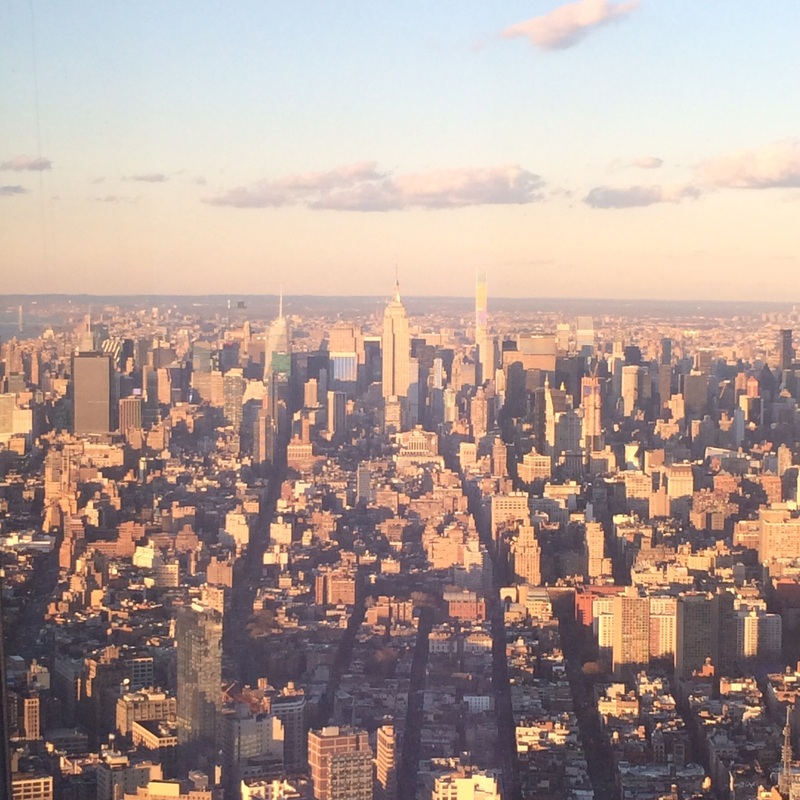 The sun setting makes the city more beautiful from this view! It’s not always necessary to book, but I would advise it as I can imagine during peak times it can get really busy. 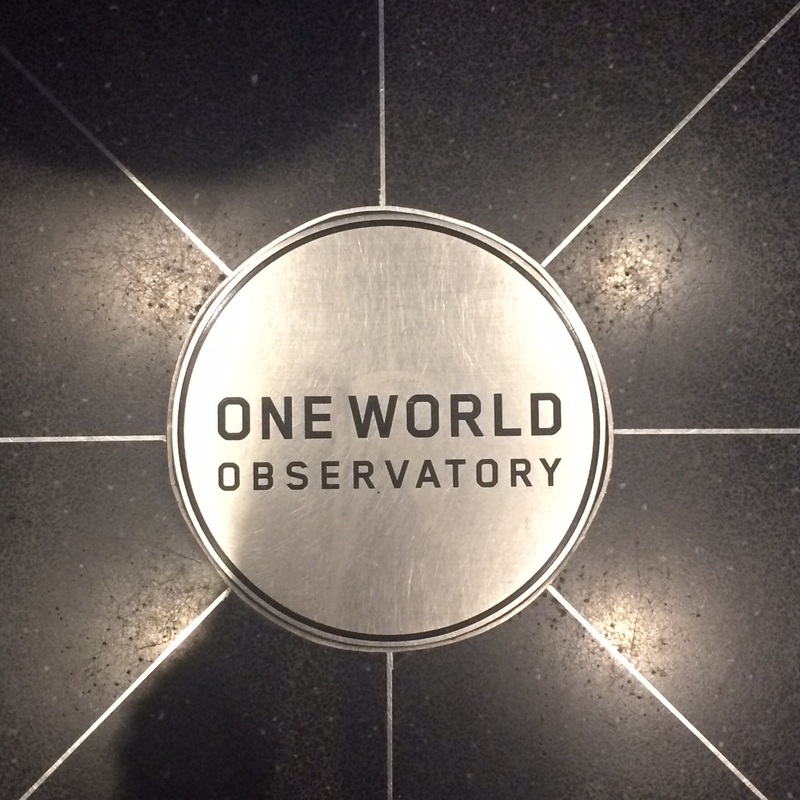 You can see more information and book online at their dedicated website: https://oneworldobservatory.com. I really hope you all get to experience One World Trade Center one day soon. My photos simply do not do it justice.